I'm very excited about Dye Monkey Yarns first anniversary. Woooohoooo! Starting this business, meeting so many wonderful new fiber fanatics, and exploring color and dyeing techniques has been an amazing experience, and I'm grateful to everyone who has joined me on this journey. To celebrate, I have several special offerings. First, and foremost, my entire Etsy shop is on sale! Please use coupon code: PARTY35 and you will receive 35% OFF any purchase now until May 31st. Secondly, this offer is good for any custom orders initiated before May 31st. If there is a colorway you love that you'd like specific yardage for, or dyed to a specific base, please contact me via Etsy and we will arrange it. I will be randomly announcing giveaways all month long, but the Grand Prize Giveaway is this fantastic collection including a coil fabric project basket, one full skein of "Swimming Hole" on HipHop Monkey, and Toe-Up Socks for Every Body by Wendy Johnson, valued at $78.00! (Doesn't that yarn co-ordinate beautifully with that basket! Wow!) No purchase necessary! Send me an email. You can say anything in your email. Congratulate me. Tell me what color you'd love to see in the future. Ask me a question. Make me an offer. Tell me you are deathly allergic to wool, but it all looks pretty. Tell me what you'll do with the prize if you win. Anything. Giveaway is open to US and Canada only. Winner will be chosen randomly from all entries, and contacted for shipping address. Prize will be shipped no later than June 6th. Podcasters/Bloggers working as teams/partners will need to sort the prize out amongst themselves. Dye Monkey Yarns officially opened April 30, 2015, but celebrating for just one day is nowhere near as much fun as celebrating the first anniversary for the entire month of May! It has been an exciting year. I've dyed hundreds of skeins of yarn in over 50 different colorways. I've done in-home trunk shows for some wonderful hostesses and a couple of craft fairs. I've met hundreds of wonderful crafters. I've fulfilled a number of custom orders and shipped yarn to four different countries. I've expanded my product offerings to include different bases. And I've had lots of fun. So what will the month long celebration include? Yarn of course. New yarn. I'm bringing in a couple of new bases for you to play with. And, new colors. Lots of new colors. What else? Sale prices and giveaways! 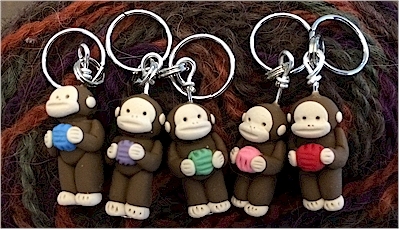 Giveaways will include books, yarns, and custom stitch markers featuring the dye monkey! Keep an eye out for announcements here, there and everywhere beginning Saturday April 30th. You've been there... the sudden antsy, overwhelming desire to cast on all.the.things. We crafters generally refer to this phenom as "start-itis". But what is it really? What causes this, and how do you deal with it? Start-itis for me is dangerous. I have to be really careful when I have an episode. Just about any project I cast on during a bout of start-itis is doomed to failure. I'm hectic, frantic, antsy and impulsive during these episodes. I suffer an overwhelming blast of creativity. I impulsively buy patterns; I'm sure designers LOVE this, but my wallet doesn't. My episodes almost always happen later in the evening, a mere hour or two before bedtime, or about 30 minutes before I need to leave for a trip, meeting, knit group, dr appt, etc. I inevitably make tragic combinations of patterns and designs. I frantically wind skeins, search for needles and cast on disasters - often repeatedly and eventually killing otherwise excellent fiber. I make dozens of heavily edited charts, piles of sad swatches, and in the end, I'm so disappointed and burnt out that I often can't knit for days afterwards. It took many, many episodes before I started to watch the symptoms and work out strategies to survive start-itis. I think start-itis stems from the intersection of boredom (or fear thereof) and inspiration. When these two states meet, inspiration by contrast is exponentially bigger, and with a lack of structure becomes a wild fire. Therein lies perhaps an answer: structure. Inspiration in a structured environment channels into great designs, great projects, great everything. Take the pressure cooker "Project Runway" as an example. Give designers a limited budget and limited timeline with a general goal and blam! Genius happens. Loosen this structure, give them a bigger budget, send them home for 6 weeks, and flop! Designers without discipline and self imposed structure develop expensive ten piece collections that lack coherence and vision and spend three days in a panic reworking and starting from scratch. My start-itis differs only in that I often have a time constraint, and I'm the only judge. And so now when I recognize an outbreak coming on, I apply structure. My structure consists mainly of a forced lengthened timeline and a current project. I pull out a notebook, a WIP and I determine that I won't cast anything new on until x amount of the current project is complete and/or I have a definitive plan/design in place - with ALL the details worked out. This plan can vary. As I work my WIP, I fantasize and work my way through a new design, plotting through shape, drape, color, sizing, stitch pattern, editing, and target market, whilst taking notes. Sometimes my start-itis takes on the form of knit.all.the.things because I'm over inspired by Instagram/Pinterest/Ravelry (aren't these AMAZING gifts?!?). In this instance, again, I mentally prioritize a list of these future projects determining wearability, color, feasibility, and materials on hand. Wearability is always a biggie - often patterns for me present a fantasy that doesn't necessarily fit into my daily wardrobe. Mindlessly progressing through a pair of useful socks whilst coming to terms with my un-glamorous life has saved me from casting on numerous ill-fitting expensive sweaters, dresses, capelets, legwarmers, ponchos, and novelty designs. I've found this technique solves the boredom, channels the inspiration, prevents disaster and in the end I'm infinitely more satisfied with my cohesive plan vs being horribly disappointed and burnt out. Have you found ways to channel or control your start-itis? Sometimes the romance of a moment is all the inspiration I need to create a new colorway. This one is called "Skipping Stones" and I've dyed it on the HipHop Monkey base. He was cute - a lot cute, and he had this fancy trick he did where he could throw a stone just so across the top of the water and make it skip. Your heart skipped when he wrapped his arms around you to show you how. Clear morning lake blue tones, grey sandy stone, silver. I love this yarn for socks, but do keep in mind - there is no nylon in this blend. It is a perfect choice for cowls and shawls. This is a kettle dyed/hand dyed yarn. 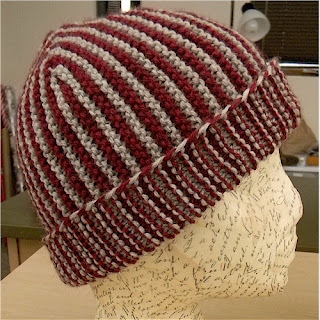 Variations will occur from skein to skein. Photos have been taken to best show colors, however color representation varies from device to device/monitor to monitor. Please message me if you have color concerns. I will match it to the closest CMYK/RGB/HEX color match for you to compare to at home on your personal color wheel/color tool at your request.